The rotator cuff is compromised of 4 principles muscles and their tendons: supraspinatus, infraspinatus, subscapularis and teres minor. Collectively they stabilize the joint and allow for movement . Tendons at the end of the rotator cuff muscles can become torn resulting in pain and restriction in motion. The majority of tears occur in the supraspinatus tendon. Typical presentation includes pain with impaired motion. Surgical treatment often involves arthorscopic repair, subacromial decompression or use of an anchor to secure the tendon to the bone. Surgical complications included fatty atrophy, re-tears of the rotator cuff, infection and failure. JG is a 32y/o patient at the Centeno-Schultz Clinic who suffered shoulder injury after a motor vehicle accident. Despite surgery in the form of subacromial decompression JG continued to have shoulder pain. 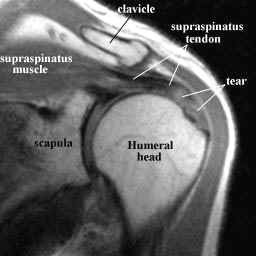 Repeat MRI demonstrated near complete rotator cuff tear involving the supraspinatus. He declined surgery and opted to undergo the Regenexx procedure whereby he could use his own mesenchymal stem cells. 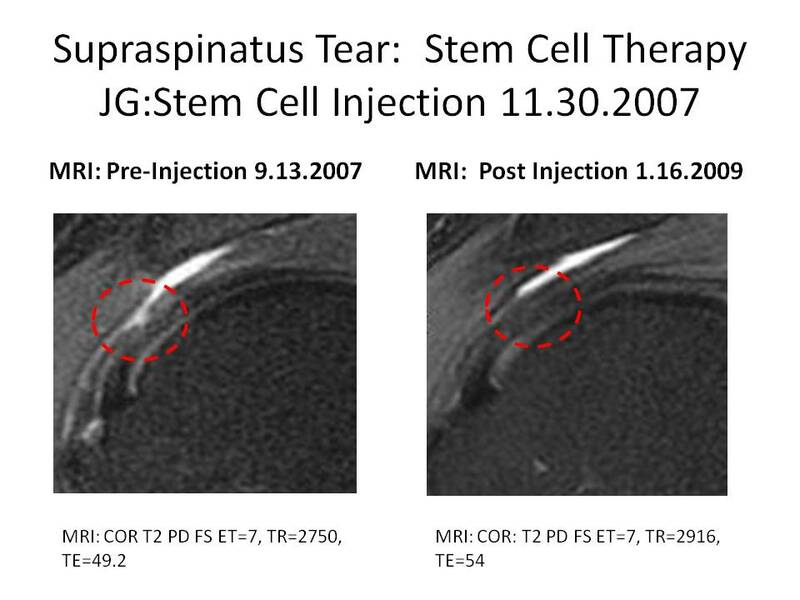 2 years after stem cell therapy JG reports greater than 90 % reduction in pain and full range of motion. Post stem cell injection MRI is posted below. The supraspinatus tendon is outlined with red circle. On the left there is a significant tear whereas on the right the tear is significantly improved. This corresponds with JG’s clinical improvement. Other patients have also undergone successful stem cell therapy for rotator tendon tears.